Derrick Rose's image took a hit while he remained sideline this season. Not returning to the Bulls lineup has caused ill will for Derrick Rose. There is plenty of time for the Bulls to heal all their various ailments after losing the series to Miami. In the case of Derrick Rose, he has some other wounds that need to be repaired between now and when he returns to play next year. The anger directed at Rose for not returning this season after major ACL knee surgery was frankly, unbelievable. There were definite mistakes made concerning the prospect of the Bulls guard’s return to game time action. His shoe company even did a video "The Return" to highlight the rehabbing Rose was doing after he was given the green light. At media day in early October, Rose sounded hopeful that he would be able to join the team during the season. At no time, publicly, did Derrick Rose or the Bulls ever give a hard date. It was all speculation that drove the story, lit a smoldering fire and turned into a firestorm once months passed. The silence of Rose and his camp of handlers muddied the waters. When there were "on the record" quotes, it was Rose’s brother/manager Reggie that caused the biggest stir. He inferred that there were other issues than his brother’s health (like the quality of the team’s roster) that was impeding his comeback. Eventually, Rose did give a lengthy interview with a national paper and from time to time spoke with the media, but nothing was settled. A report from ESPN.com writer Melissa Isaacson in March indicating that doctors cleared Rose to play stirred the pot. Once that news was out, it was assumed that he would soon be announced in the players’ introductions for a game, but that never materialized. 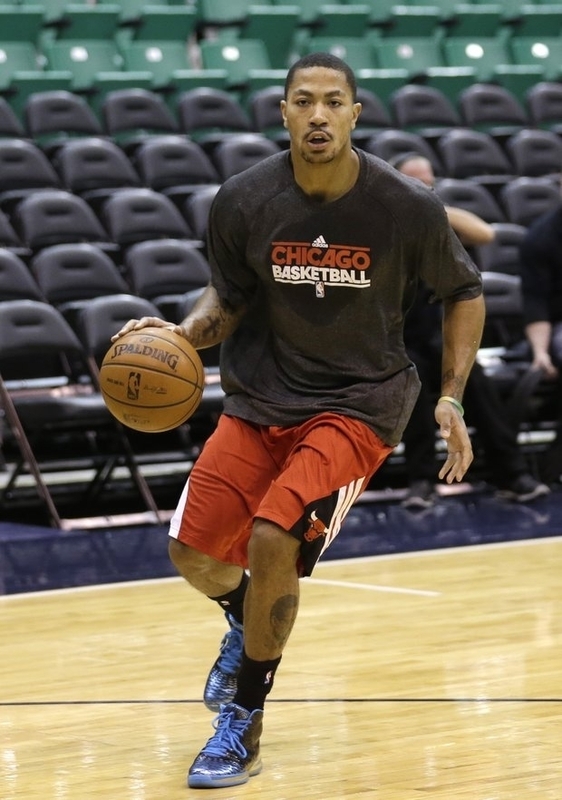 Rose did practice with the team, but the Bulls did not have many full team scrimmages at this point. With all the team ailments, film sessions and free throw shooting filled most of the practice time. Most scrimmages involved under-used players. During every interview, coach Tom Thibodeau was asked about his star player and the answer was optimistic but never definite. As playoffs approached the tide of public opinoin turned against Rose. Everyone became an expert on what was best for him. Many argued he owed it to the Bulls to return. Some want the Bulls to trade him. Last season the Chicago native suffered one injury after another, tried to play through it and was felled by the devastating one. Forget that the injury is scary for a young player that does things on the court most can only dream about. People have questioned his heart and his courage. A few weeks ago, Rose was in the hallway of the United Center and I asked him if he was hearing or reading the negative comments. He said no. Maybe he hasn’t, but he likely has some knowledge that his reputation has been marred. The reaction to him not playing is more apt for a player who has committed a major crime. Not for one trying to be completely healed in his mind and his body. What has been a problem was how it was handled. There should have been more transparency about the situation. Maybe the Bulls could have taken the decision out of Rose’s hands once the season was winding down. Maybe they did, but strategically they allowed teams to think a Rose return could make it difficult to game plan. It would have been advantageous to have a media session with the doctors, Rose and the front office to answer the whispers out loud. Hopefully, lessons were learned by everyone involved in this situation. It will be a long summer and fall before we can expect to actually see Rose on the court. If it is the pre-season, it won’t even be in the U.S. The first game is in Brazil. That doesn’t really matter, once he steps on the court and drives to the basket and lands on his feet, he and the fans should feel better. If the fans still don’t forgive him, Rose should close his social media accounts. Derrick Rose hasn&apos;t deserved the condemnation and I look forward to seeing him again on the court exciting the fans whostayed in his corner.